The fells - Yoke, Ill Bell and Froswick - form a glorious high-level spine between the valleys of Troutbeck and Kentmere. This walk approaches these fells from the Garburn Pass, using the old walled road (track) between the two valleys, which gets you a long way up, quickly and fairly easily, before you move on to the grassy slopes. At the top of the pass (447m/1436ft) you leave it for Yoke, taking a path beside the wall. In the past this way crossed an extensive peat mire but now lots of well placed stones and steps help you on your way. 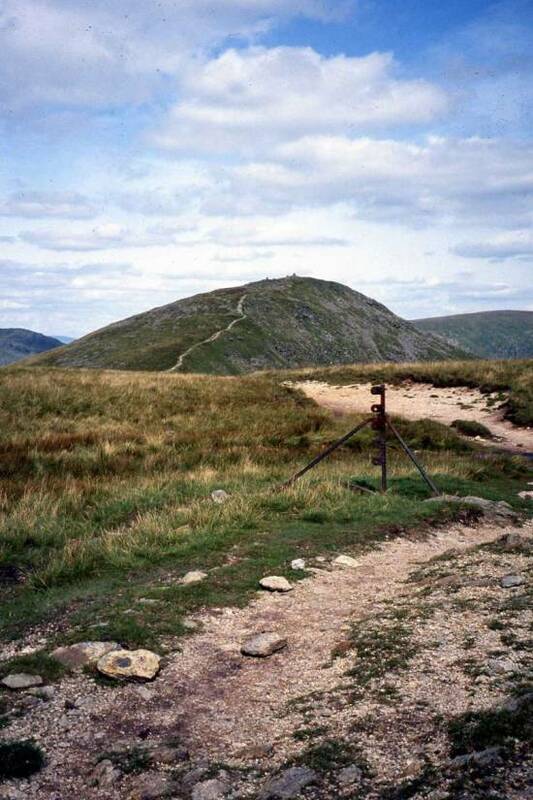 After the glorious promenade over the three tops you descend by Scot Rake, which comes down from Thornthwaite Crag and named, it is believed, after the route used by Scottish raiders. At the foot of the Rake the walk continues through the peaceful Troutbeck Valley. Here Beatrix Potter bought Troutbeck Park farm in 1923. Spare time at the end of the walk to visit Troutbeck Church, unusually dedicated to Jesus. Enjoy its beautiful east window, designed by Burne-Jones, William Morris and Maddox Brown. Its predominant colour is green, rare for a church window. From the parking area beside the River Trout, cross the pedestrian footbridge over the hurrying river and walk south for 150m along the A592. Cross the road to take the signposted Garburn Road. Follow it as it winds right to a gate and go on. Keep to the reinforced rough track as it curves left, passing below lofty trees. Continue upward, with a magnificent view ahead of the Ill Bell range. Head on and then pause at the signpost to look back for your first fine glimpse of Windermere. Stroll ahead past huge mounds of quarry waste. Enjoy the fine views down into the Troutbeck valley and, look beyond, to see the red paths leading up to the top of Red Screes. Eventually the stony walled way leaves the forest trees behind and climbs on up through pastures until it reaches a small plantation of immature sitka spruce. Go through a gate and stride the more level track over the open fell. Descend a short way to the next gate and here, just before it, turn left to leave the Garburn Road. There is no clear path over the immediate boggy ground. Pick your way through this onto a grassy trod which emerges beside the wall on your right. The way goes on, steadily up, for just over a mile. Pause regularly to look right to see Ingleborough and the Howgills and, left, for the Scafells and Gable. Then a short steepish climb brings you to a high ladderstile. Beyond walk on up the pitched path. Follow the track as it drifts right, ignoring the path going off left - the way to Ill Bell if you wish to avoid this little top. Then the summit cairn, 708 m / 2309 ft, is reached. Below and out of sight is the formidable Rainsborrow Crag, dropping almost sheer to the head of Kentmere. Descend the clear path and continue on to begin the climb to the summit of Ill Bell, 747 m / 2476 ft, cone-shaped and with three well constructed cairns. The views are stunning and you will want to linger here. Look down on Kentmere reservoir, a glorious pool of blue, and the tiny streams that join the infant River Kent tumbling down Mardale Ill Bell. Coming off the top needs care. One exposed path winds round the cliff edge. Another descends on a rocky path well away from the edge. 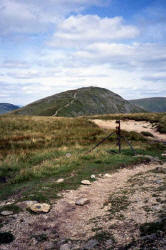 Both leads down to the coll to join a path that by-passes the summit, a continuation of the the path that goes below Yoke. This narrow path also runs below Froswick, but it crosses much loose scree and should be avoided - in any case who would want to miss the easy and delightful scramble up to Froswick’s cairned summit 720 m /2359 ft. Again this is a place to linger. 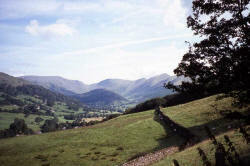 Look ahead to see two green paths descending, left, into the Troutbeck valley. Go down from the summit and walk on passing above, on the left, Blue Gill, which splits the fell side from top to bottom. At the lowest part of the col, walk left across the tussocky grass to join the wide grassy Scot Rake, and begin the long easy descent, to a gate beside the infant Hagg Beck. Beyond, go on gently downwards to join the clear track continuing, left, through the valley. Stroll on the gated way, below the formidable side of Ill Bell and on past quarry waste. Ignore the National Trust footpath, which goes off left, and stride on along the gated track until you can take the signposted kissing gate on the left. Descend through a wall and stile over a pasture join a track at Hagg Bridge, where the beck adds its water to the Trout Beck. Stroll on the pleasing traffic-free lane to cross Ings Bridge and walk on. Where the lane turns sharp right to Town Head, press on along the signposted narrow hedged bridleway, a floral delight in summer. This eventually brings you to the A592, which you cross to continue up a hedged lane. Follow it downhill and, where it swing right, walk a signposted walled track on the left. Go through the kissing gate on the right and press on along a grassy fenced path to pass through a delectable copse of trees. Continue over a meadow, using the grassy path. Bear left and walk a hedged track to take, on the right, a white gate into the churchyard. Go right and then left to leave by a gate. Two more right turns return you to the parking area. Terrain: In spite of all the work done on the Garburn Road it is still quite rough. Some grassy slopes can be boggy. The return is made on good tracks, paths and narrow roads. Refreshments: The Mortal Man and the Queen’s Head, Troutbeck. Wide choice in Ambleside and Windermere.